It’s no secret that June is prime wedding season, which means chances are there are many marriage proposals happening as well. One of the biggest reasons a proposal gets delayed is the cost of buying the engagement ring and wedding band, but thanks to the Macy’s June Ultimate Pop-Up Sale, that is no longer an issue! (I’m partial to the Three-Stone Diamond Ring pictured below that’s also available in 14k Gold, White Gold or Rose Gold (1/2 ct. t.w. ), just like the Diamond Wedding Band. This ring happens to be on sale for just $715 and is regularly $1300! 2. 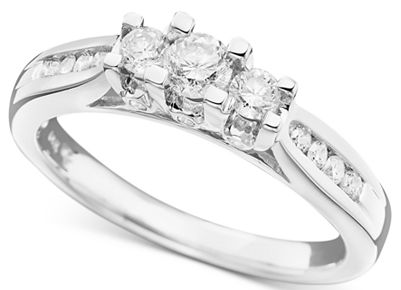 Choose your Diamond Wedding Band Ring (1/5 ct. t.w.) from these three options: 14k Gold, White Gold or Rose Gold for only $99! 3. That’s it! When you purchase the ring deal I outlined here, you’ll be getting two wedding rings for under $1000 plus free shipping. Incredible. 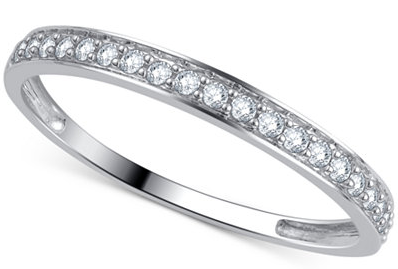 This gorgeous shimmering band (1/5 ct. t.w.) is beautifully set with round-shape diamonds and is available in 14k gold, white gold or rose gold. Remember, during the Ultimate Pop-Up Sale, you’ll also get free shipping on any purchase that is $49 or more (which obviously your engagement ring and wedding band package would be). So if you’ve been shopping for that perfect wedding ring at Macy’s but have been waiting to pull the trigger, now is the time! Even though the Ultimate Pop-Up Sale ends on June 20, this $99 Wedding Band special is valid until June 24, 2017, just keep in mind that the engagement ring prices I listed above may not be the same after Tuesday.